Cooking for one is actually a lot more enjoyable than I thought it would be. I love having lots of leftovers for lunch the next day. This meal was a little messy but very satisfying. The turkey meatballs are a one-pot deal and then I sautéed the bok choy. The Thai turkey meatballs are from this recipe. The bok choy I sautéed with garlic, sesame oil and tamari. 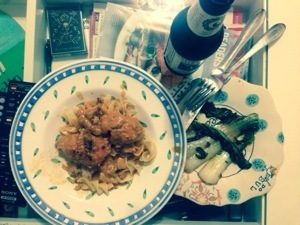 This entry was posted in weeknight and tagged bok choy, meatballs, thai, turkey, weeknight. Bookmark the permalink.